it can only mean one thing. For those of you who do not know where I am going with this, it is finally here! The full gauntlet of college football officially kicks off this weekend! As Learning and Development professionals it is time to ask ourselves… What does this mean to our industry? Or perhaps something more pertinent, such as, what lessons can we learn from these competitions and the pomp and circumstance that surround them? To our industry, the collegiate hierarchy means a lot, as it is the backbone of many corporate learning programs, and since a majority of these large schools devote contributions directly into their athletic programs (mostly football). It must be exceedingly important. So, let’s lay the groundwork with some comparisons. College athletes have a lot in common with the younger members of your personnel. They possess similar mentalities, motivations, educational backgrounds, and drive for success. The comparisons do not just end there. They are both incredibly talented, attempting to improve themselves, and they just need help realizing their full potential; in order to develop the necessary skills to climb up all the way to the next level. That is where coaching comes in. In College Football more than anywhere else, a coach can be the difference between five wins a season and obtaining an undefeated record. The best coaches achieve success with great game-plans, proper attention and research into proven methodologies, and an appreciation to their competitors and what their efforts for improvement may be. Instructional designers have been trying for years to come up with the perfect teachings for organizational entities, with learnings ranging from electronic, social, micro, mobile, instructor-led, and blended. But all the content in the world can only get you so far when not paired with real life circumstances and the experiences of someone who has undergone the difficult processes in their infancy. Someone who has been there, experienced that, and advised you how to use the methods you have learned in your learnings, and encourage you to succeed within this environment. 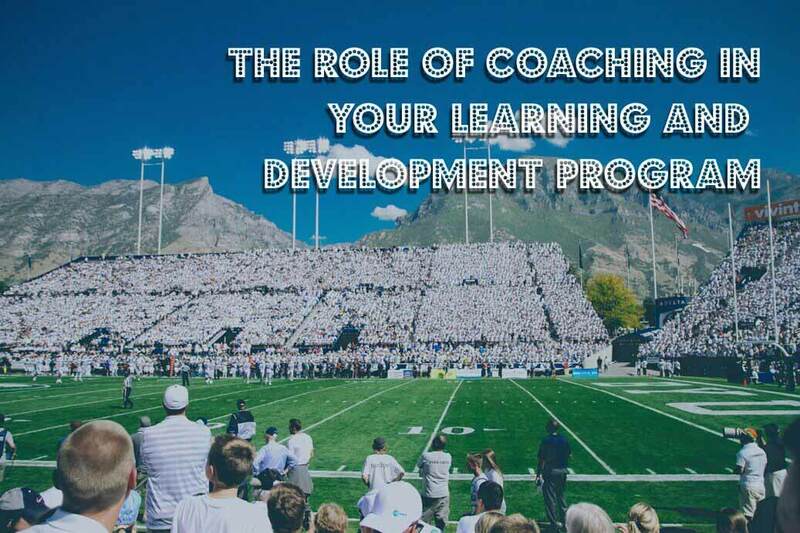 Coaching is not just a byproduct of good social learning, in fact, the best learning programs find ways to implement coaching into their offerings in a highly regimented manner. How can my organization utilize coaching? In learning concepts and methods for improvement within an organization, it is best if relayed in a manner consistent with the environment your staff is encountering. This approach can best be implemented departmentally. Set completion deadlines for learnings, then offer subsequent meetings learners who have freshly completed said learnings. Let the students interact with each other on what they have learned. In these meetings present the employees with real-life practice problems or perhaps current departmental issues that best reflect the teachings of the lessons. Listen closely to their input and coach them towards the proper methodology to accomplish an adequate resolution. Seeing processes first hand can be the connection point required to finalize the learning with individuals, as this can be the way they best learn. These meetings will be very productive for your organization. Like college football, they are best served in a repeatable fashion. When you become a fan of college football, you do not just watch one game. Instead, challenge your workforce weekly or bi-weekly in these endeavors. Eventually strong members of your organization will take on the Quarterback roles and become the on-field coaches your organization has always desired, yet did not know they needed. Be sure not to stop there, coaching involves so much more than instruction towards a positive outcome. It can also consist of reinforcement of techniques and procedures. When in a coaching environment, do not be afraid to figuratively pat your students on the back. Things like, “Hey, Awesome Marketing Person, your most recent blog changed the way in which I view our product. Utilizing those freshly established brand guidelines you have learned, you have really gone above and beyond the cause on this one.” All the way to, “That was a really great sales meeting Bill, the way in which you incorporated our sales training techniques in the front end of that call was completely legendary.” These will go a long way into extending the reach of your learnings, as well as motivating your workers to achieve even greater things. In summary, coaching is a unique value added concept to a learning and development program. It allows the program itself to systematically convert the learnings experienced within a learning management system to real-life applications that they present. Consider making these quick and easy additions to your program today, in order to get the most out of your program. We hope you have enjoyed this reading and are ready for the beginning of the season now. Please continue to join us week to week, in order to see what we will be up to next.